Never purchase a wear-item by mail-order on the eve of a major trip! I know, I know…but logic be damned. Two years ago I took a shine to Forma’s ruggedly handsome Adventure boot and ordered a pair online mere days before setting out to learn badass off-road techniques at California’s Rawhyde Academy. Now, I’m no “Dog Star” when it comes to math, but I do know that the 45 Euro-size boots that arrived at my door were no 10.5 U.S. equivalents. In fact, they were big enough to fit a Sasquatch. “Send ‘em back, Baker!” said the left side of my brain. “Nothing a double pair of ski socks can’t cure,” replied my dominant right side, signing off on two years in which I clodhopped around like Herman Munster. Other than that, I adored ‘em. BMW MOA 2016 proved an inspirational place and time to upgrade. I tried on half a dozen marques and types before easing into an eye-catching pair of Sidi Crossfire 2s. 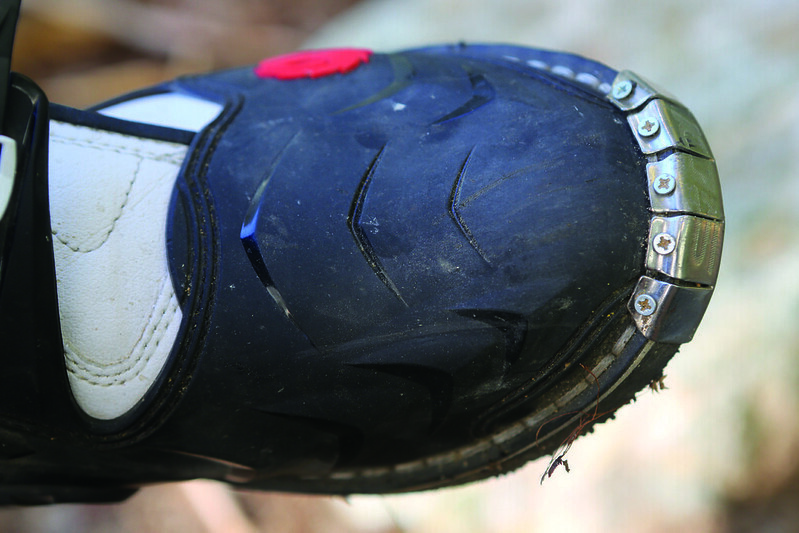 If there could be a motorcyclist’s equivalent of Cinderella’s slipper, this was it. They were as snug and form-fittingly comfy as a pair of sneakers. 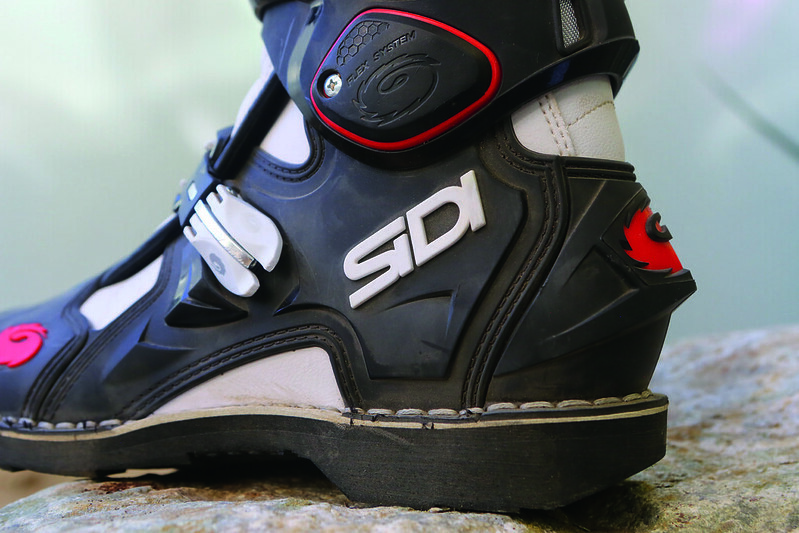 With a major off-road trip to Baja California coming up, this newest evolution of Italian company Sidi’s top-of-the-line off-road boot had me sold. I ordered a pair from Motonation, the company that represents Sidi in the USA. The Crossfire is intended as a serious off-road/adventure boot designed, above all, for maximum protection and comfort. But trust the Italians to conjure such sophisticated Lamborghini-like styling. 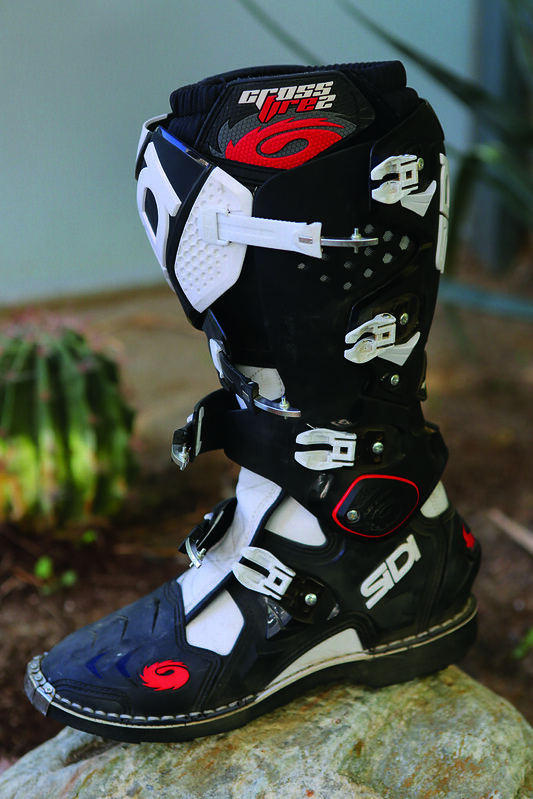 Imagine BMW’s GS Adventure boot crossed to StormTrooper footwear on steroids. With enough armor-plating to stop a rhino, the boots aren’t light, though not heavy, mind you. Right out the box you get a sense that this is top-quality, don’t-mess-with-me footwear in a league of its own. Stitching (double-stitched in stress areas), for example, is superbly done and the adjustable screw-on plastic protectors match seamlessly. Plus the anatomical fit is as near perfect as I could imagine. I wear a 10.5 U.S. My 44 Euro Sidis were true to size. The sole is slim, and proved perfectly proportional to my foot shape. Even though I wear a pair of knee-length ski socks inside my boot, my toes weren’t scrunched. After my first ride—a full nine-hour jaunt to the Horizons Unlimited Travelers Meeting, in Yosemite, California—my feet felt as fresh and comfortable as the moment I eased into the boots. (The Crossfire TA version is a tad wider, but riders with wide feet might also consider going up a size; the boot is available in sizes 7-13.) I’ve worn some nice fitting boots in my time, but nothing quite like this; did I mention the soft inner lining of Cambrelle? I also appreciated the inch-deep, elasticated, softly padded top gaiter seal, which wraps snugly above the calf muscle just below the knee and is lined with Teflon mesh that Sidi claims will prevent absorption of water and sweat. The boots aren’t waterproof, but darn near. Snaking up into the Sierra Nevada, I hit prolonged showers. Nothing heavy, but enough to get a sense that the Crossfire will resist a good dousing. The entire “base material” appears to be supple leather. Actually, it’s synthetic. 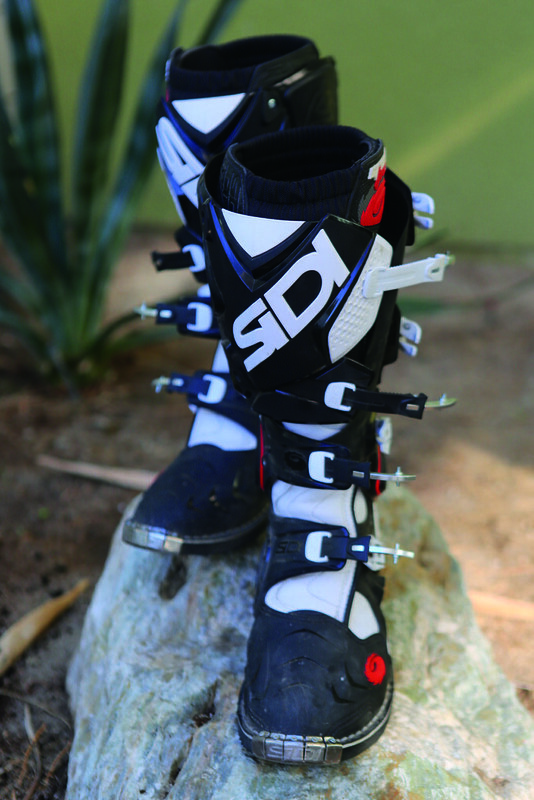 Sidi uses its own proprietary material called Technomicro. This composite micro fiber is made from strands less than one-thousand the thickness of silk, bonded with special resins to produce a kind of Cyborg leather. Lighter. Softer. Stronger. And, Sidi claims, “water-repellant, quick-drying, breathable and permeable to water vapor… abrasion- and mildew-resistant” and “easier to clean than leather.” Wow! If this were a real Cyborg I’d date her. The Techmicro base—white in my case (the Crossfire comes in ten different color combinations)—seals at the top and mid-section with two broad Velcro flaps that draw closed to the boot’s outer side. The base is encased by a flexible injection-molded plastic wrap affixed and hinged to the ankles, and to which are attached three thicker, rigid plastic protectors for ankles, shin and calfs. 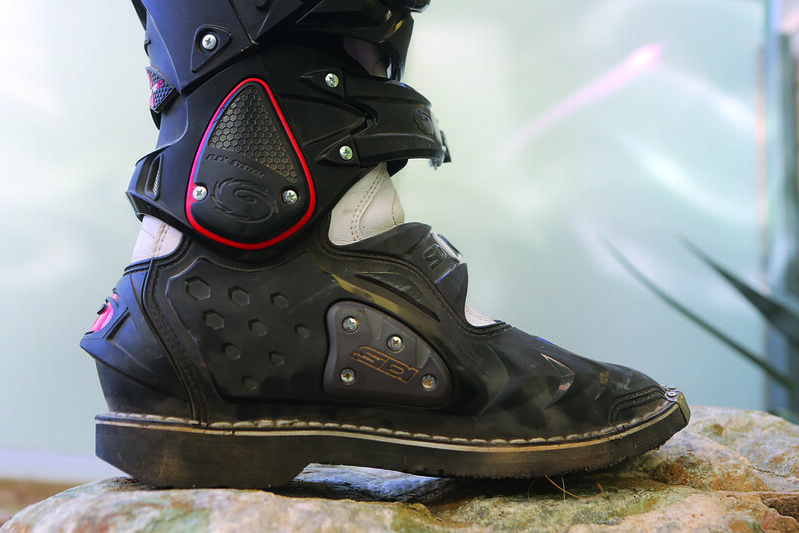 The calf and shin plates can be adjusted for a wider diameter (22 inches is the maximum) to accommodate fatter legs or knee braces, or to wear your pants inside your boots. The entire leg is thus protected, all-around. Additional hard plastic shells protect the entire foot area, including a rigid, anatomically shaped, shock-resistant heel and a toe guard extending up to the metatarsal the full width of the boot. The toe guard thickens on the inner top side at the shift and brake lever points. The toe of the molded, anti-skid sole is guarded by a screw-in metal plate. Plus, the inner arch features a thick heat-resistant changeable pad affixed by screws atop a larger plastic plate that gives rigidity to the lower boot. The protective covers draw close with a four-strap cam-lock buckle system that locks to the outer side. Even when wearing gloves, the four metal hasps were easy to mate into their plastic cam-lock buckles, which snapped shut securely. The hasps attach to plastic straps that can be adjusted—shorter or longer—for a perfect fit. I’d read that adjusting the straps is easy. Not! I was flummoxed by what visually seemed like a simple task. I told you… I’m no Dog Star! Fortunately, I didn’t need to adjust the straps. The factory default was perfect. The real beauty of the Crossfires is that the boots flex. The hinged ankle and flexible vamp (no plate covers the upper midsole) let the boot pivot forward, assisted by a smaller hinge further up the calf. The boot is designed so you don’t overdo it. I reckon the maximum flex at about 20 degrees from vertical, giving the boot on the foot a nice “broken-in” feel straight out the box. A week later, riding off-road in Baja California, the flex proved super handy when standing on the pegs in the rough stuff. I began to understand why many a motocross champ swears by Sidi Crossfires. Full gallery of Sidi Crossfsire images below. Want more great reviews from BMW MOA members? Take the BMW Owners News for a test ride and get Member Tested reviews and more delivered every month!